If you’re traveling solo and looking for a fitness holiday, you’ll probably want to ensure that you’re going somewhere that has other like minded people on the trip and that you are in the hands of a team of friendly professionals who can ensure that you receive (and enjoy!) great, personalised training sessions. On most in:spa retreats, approximately 70% of guests choose to travel alone (many of whom will have been on one or more in:spa holidays before) and they come with the same goal in mind: to get fitter and healthier, have fun and enjoy some sunshine. in:spa has been hosting its unique brand of health, fitness and detox retreats for over 10 years and was recently awarded the accolade of Most Consistent High Performer by Conde Nast Traveller magazine. in:spa runs its week-long retreats in several beautiful locations throughout the year, in destinations such as the South of France at a gorgeous private chateau, in the foothills of the Atlas Mountains (at a stunning boutique hotel with sensational views, near Marrakech) and rural Tuscany at a beautiful estate, with its own lavender field. See all in:spa destinations. 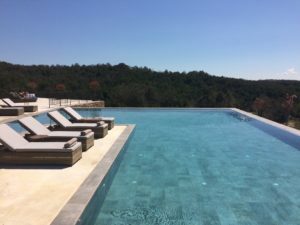 in:spa fly out a team of highly regarded experts from London for each of its retreats, comprising two personal trainers, a yoga teacher, specialist chef, massage therapist, nutritionist and a host. The daily programme on each retreat varies depending on the time of year and the venue, but there will be a variety of classes, sessions and activities each day designed to get you fitter. 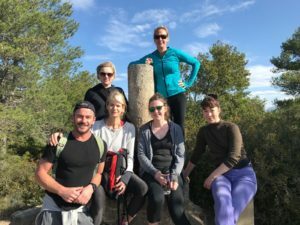 There are regular guided hikes in the surrounding countryside, daily circuit training sessions, personal training, boxercise classes (always particularly popular with female guests! ), runs and jogs, lots of stretching and energising morning yoga. All classes and activities are cleverly designed and expertly overseen to ensure that all guests, whatever their fitness level, can take part at a pace that suits them – but, if requested, be pushed and motivated to achieve maximum results from their week away. With so much going on every day, it’s good to know that time is put aside for relaxation. This includes time to sunbathe beside the pool, enjoy a restorative massage (all guests receive two complimentary massages each week) or simply sit somewhere in the gardens with a good book. All guests come together for meals which, as anyone who has been on an in:spa retreat will tell you, are both sociable and delicious – find out more about the gourmet cleansing cuisine created by the specialist chef and nutritionist. And, at the end of an action-packed day, guests retire to their extremely comfortable, spacious, ensuite bedrooms for a good night’s sleep. For full information about all forthcoming in:spa retreats, please see dates, prices & destinations or call 020 3235 0120 to talk to one of our retreat co-ordinators.